Barb Reddick claims she agreed to split the money with Tyrone MacInnis if they won the consolation prize, not the jackpot. Organizers handed Barb Reddick and Tyrone MacInnis separate cheques after a photo op on Thursday. HALIFAX — A Nova Scotian woman at the centre of a family feud over a $1.2-million-dollar lottery win is staunchly defending her bid to keep her nephew away from his share of the jackpot — even though both of their names are on the winning ticket. 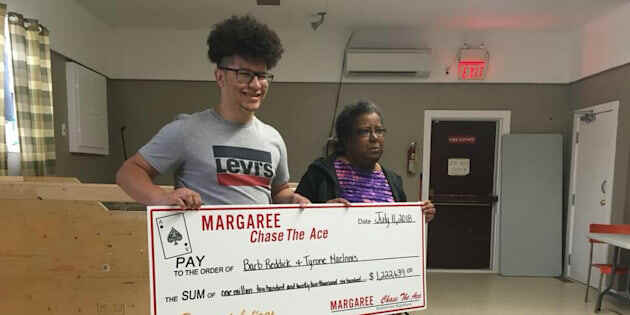 Barb Reddick and Tyrone MacInnis each won $611,319.50 from a Chase the Ace lottery in Margaree Forks, N.S., on Wednesday night, though Reddick insists the full amount — $1,222,639.00 — is rightfully hers. Reddick, 57, said Friday she sent MacInnis money to buy $100 worth of tickets and told him to put his name on them for "good luck." She said there was no discussion about splitting any winnings. During a celebratory photo op Thursday, the two family members were handed separate cheques. Reddick then told the 19-year-old she intended to take him to court. "I'm not being greedy," she said Friday in an interview from her home in Guysborough. "Tyrone's like a son to me. I bought Tyrone everything ... and he wanted big-ticket items." Reddick said MacInnis — who lives in Glace Bay, N.S. — doesn't deserve the money, saying she recently bought him a car and sent him cheques every month to help cover his college expenses. MacInnis could not be reached for comment, but a family friend said in a Facebook message that she was saddened by the situation, describing the young man as a "great guy." When the winning ticket was drawn Wednesday at the local firemen's club in Margaree Forks, neither Reddick nor MacInnis were there, and their attendance was not required. A fireman drew the card on their behalf. In an emailed statement, a spokeswoman for Nova Scotia's Alcohol, Gaming, Fuel and Tobacco Division said if names are listed a winning ticket, the agency expects the lottery licensee to split the prize equally amongst those named. "From our perspective, the prize has been awarded and the lottery is concluded," the agency said in a statement. "If there is a dispute between the winners, it should be resolved by the parties involved." On Friday, Reddick said she was waiting to hear from a lawyer. The ugly outcome came as a shock to Bernice Curley, chairwoman of Chase the Ace Margaree. "We would not have known there was any animosity or anything until after they finished getting their picture taken with the cheque," she said. "It literally came out of nowhere." Curley said she was disappointed that the controversy has overshadowed the fundraising event. While she said they're still counting the money earned from ticket sales, a "substantial" portion will go towards some new equipment for two Margaree-area fire departments. Over 100 volunteers helped with the event, she said. "For us, we pulled off an amazing fundraiser in a very small community with a whole lot of help from that community, and this overshadows it," said Curley. "This is not what we wanted to be remembered for."